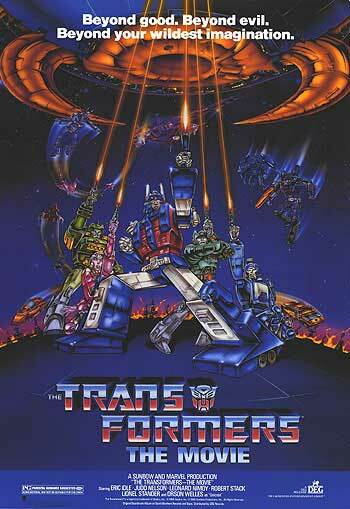 A week or so ago, a conversation broke out on Twitter about the original 1985 Transformers animated movie. Most of my fellow twitterers who were involved expressed fond memories of the old film and a much more ambivalent tone towards the more recent offerings from Mr Bay and Mr Speilberg. I too have developed a greater appreciation for the original movie over the years. I’m not about to suggest it was an iconic moment in cinema, but it had quite a few things going for it. This is not to say it is without it’s flaws. The first half hour or so does have a few plot holes, certainly I am still not sure how the Decepticons were able to sneak up on, board and capture that Autobot shuttle so easily. Or for that matter how one shuttle full of Decepticons was able to make such an impact on an entire fortress full of Autobots. Of course part of my incredulity might be due to all those times the main animated TV show shown the Decepticons as marginally competent at best. But these lead to the big battle that is the centrepoint of the first part of the film, with many moments of daring-do on behalf of the valiant Autobot defenders as they hold out until reinforcements arrive. At which point Optimus Prime breaks the back of the Decepticon assault seemingly single handedly, culminating in him defeating Megatron in personal combat. 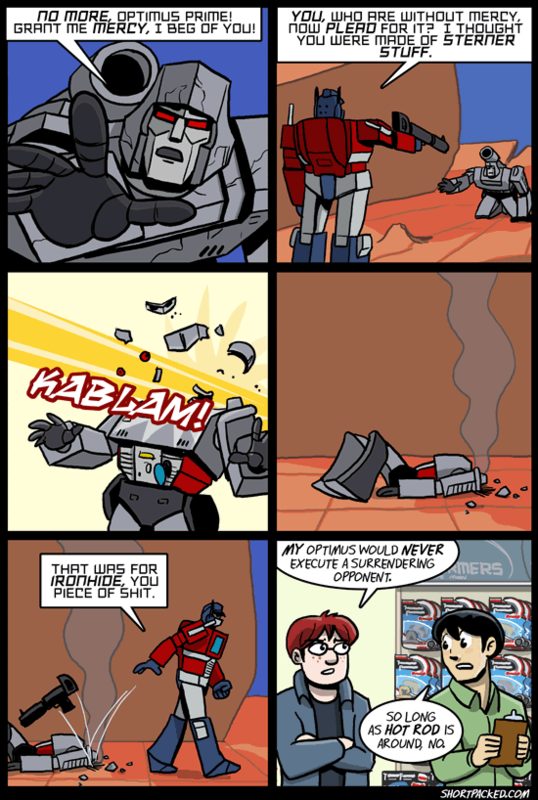 And then, of course, Optimus Prime dies. By the time I saw the film for the first time, the closing voice-over narration had been changed to include a prophesy of Optimus Prime’s eventual return. But the hour or so between those two points of the films was a pretty hard one for seven-year old me. Say what you like about the rest of the film, but Optimus’ death scene was a masterforce, as he passes leadership to Ultra Magnus with his dying words, the light of his eyes goes out and his entire body fades to an ashy black. This is pretty powerful stuff, even when you factor in the fact that this was essentially a children’s movie. The next several months were a basically an agonised wait until the TV episode with Optimus’ promised return became available. There are other good moments. Megatron’s transformation into Galvatron, Unicron transforming for the first time to attack Cybertron, The Dinobots versus the Sharkticons. And however much it might irk me, Hot Rod’s elevation to Rodimus Prime was well executed. And of course there is the soundtrack, featuring such iconic pieces as The Touch and Dare by Stan Bush. Unrepentantly eighties of course, but still great. And certainly the original version of The Touch is preferable to Bush’s dubious 2009 reinterpretation. It’s easy to forget that this film also introduced several aspects of the Transformers mythos that would become staples of all future interpretations. 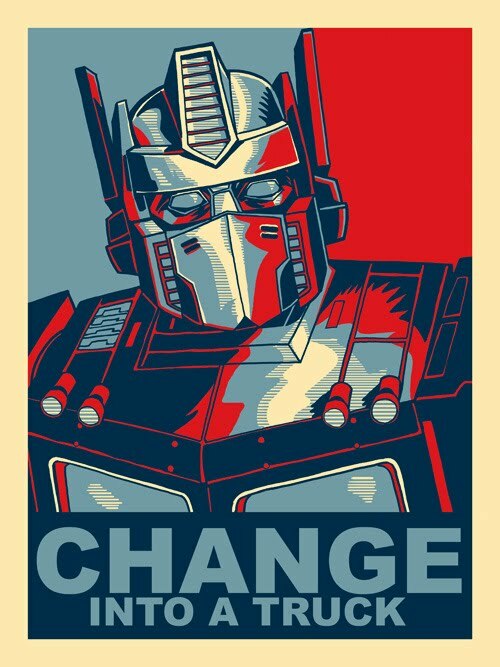 Most importantly, the Matrix of Leadership and Unicron. Though it was the exploration of these ideas in the Marvel tie-in comics that really defined them. The film also introduced the idea of Optimus Prime ding, only to rise again, and Megatron being transformed into Galvatron. Both of these ideas have been dutifully revisited in most subsequent revitalisations of the Transformers franchise with an almost tedious inevitability. There were a few weaker bits to be sure though, anything involving either Wheelie, the Junkions (even with Eric Idle voicing their leader) or Daniel, the annoying human sidekick are less good parts of the movie. And as mentioned above, the fact that by the end of the film destiny has apparently chosen as Optimus’ true successor the meddling punk whose interference got Optimus killed still grates on me. I sometimes wonder if the Matrix would have opened for any Autobot at that stage and Hot Rod just happened to be the guy who was there. It wasn’t a great film, and it was frequently silly and prone to animation glitches but it was fun and better plotted than many ‘glorified toy commercial’ movies, and strangely enough it managed to be more serious and more mature than the more recent offerings from Mr Bay.